The clear headlights are absolutely a highlight to me here. 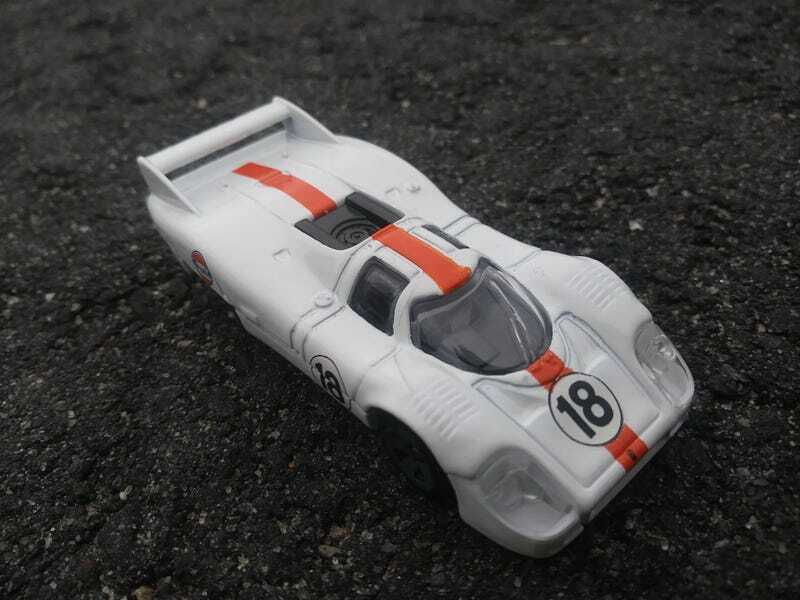 Stop me if you think that you’ve heard this one before, but I’ve recently obtained a beautiful classic racecar that’s part of the new Hot Wheels lineup, and... yeah, you guessed it, it’s the Porsche 917! Made famous from its appearance in Le Mans, as in, the movie named Le Mans about the 24 Hours of Le Mans motorsports even, and its appearance in Le Mans, the, uh... the actual race. Okay, so to be honest here, I was gonna throw this in my Rennsport Reunion rotation, and then I saw a ton of these beauties already doing this exact car either more accurately (the Gulf Oil livery was blue; the white is a variant for the diecast release) or in wayyyy more detail. But, I mean... I love this car. It’s on my desk so I see it every single day, even more prominently than the cars on the bivouac (which is just what I call the shelf of haulers right above my desk). Plus, I really don’t have enough Porsches to fill in until the ones I really want to get to, so I might as well share some sweet shots of this! The layout of the Circuit de la Sarthe has changed over the years, but for the configuration that the Porsche 917 ran, it still holds the record (and that was set in 1971). Probably better known nowadays than the Gulf Oil paint scheme that was replicated in the film Le Mans is the Pink Pig test car, which was decorated like it were a butcher’s cut. I’m personally partial to the sleeker styling, but this past Le Mans, the car was brought back into the spotlight by a tribute paint scheme to the Pink Pig. The 917 ran in motorsports competition from 1969 to 1973, but this is definitely the 1971 Le Mans version of it. The back wing is the big tell. It did Can-Am competition afterwards, but was very much reprofiled. There’s your obligatory Pink Pig. Anyways, not all too much to say here, but where I usually set the bar as the Baja Bone Shaker as far as cool factor goes, this passed a different criteria: I wanted to take it out of the package the moment I saw it. It made it to the register but not the parking lot. It’s got old-school cool, excellent detail, and basically is THE image of a classic aerodynamic race car.